Prior to moving to Wisconsin, Godsave and her family lived in what she described as a “food desert” in Oklahoma. Living near a food co-op has been an exciting change, she said. “We were totally stoked to be two blocks from this great food co-op in small-town Wisconsin,” Godsave said. “We’ve been regulars pretty much since the day we’ve moved here." MMFC, located at 814 Main St. E, is near her home and it’s on the way to her and her husband’s jobs, making it a convenient stop for all her family’s grocery needs – from milk to sweet corn to rotisserie chicken. The grocery store is a one-stop shop for individuals and families with dietary restrictions and limitations, for the environmentally conscious, for people who want to support local producers, and for anyone who wants great grocery products. MMFC offers a selection of grocery staples and an array of vegan, gluten-free, and organic options. Since moving to Menomonie about a year-and-a-half ago, Godsave and her family have made friends with the employees and growers at the co-op during her daily trips there. Godsave has even made friends with the co-op’s general manager, Crystal Halvorson, who helped Godsave find a recipe from her past. When Godsave lived in Milwaukee, she worked at a food co-op called Outpost Natural Foods. Godsave was reminiscing about a florentine spinach burger that she missed from working at Outpost, and Halvorson got her the recipe for it. “It’s just an invaluable thing that you could do for somebody, and that’s just really cool,” Godsave said. The co-op got its start in 1973, when five Menomonie locals got together to pool their resources and buy food in bulk. They received their purchases in monthly shipments with notable savings. From there, more and more people wanted to join, and the program slowly expanded. Years later, the members opened the co-op’s first storefront half a mile from the current store’s location on Main Street. Soon after, it relocated to the Methodist Church on Seventh Street and Wilson Avenue. MMFC stayed on the small side for the first three decades of its existence, Halvorson said. With 200 to 300 members, the co-op didn’t have any paid employees; instead, people worked on a voluntary basis. Around the turn of the millennium, MMFC moved to its first downtown location, which is where the co-op began to flourish, Halvorson said. But the growth didn’t stop there. In 2015, MMFC purchased land on Main Street, where they built the new, current location for the co-op. This space, Halvorson said, is nearly five times larger than their previous location. “Our other old store, where I started, we could fit inside the produce section of our current store,” she said. 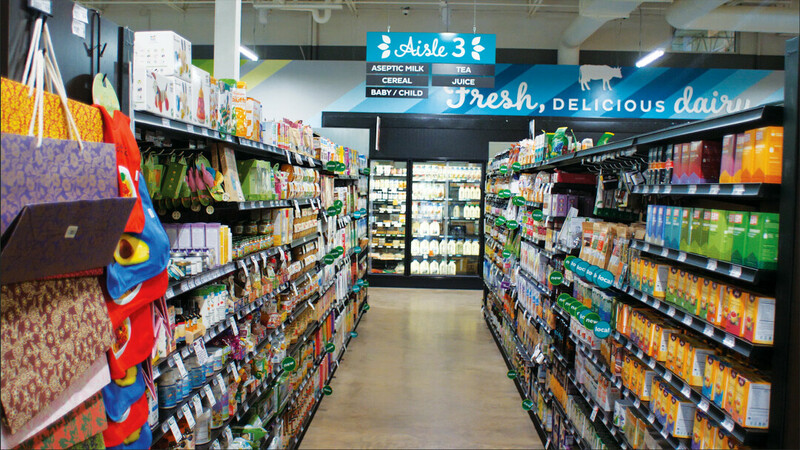 For this expansion, they sold stock in the co-op, which helped them reach their goal of raising $1 million in just six weeks, making them the smallest co-op in the country to do so, Halvorson said. The co-op membership has grown from the original five owners to around 2,500 families and individuals who co-own the grocery store. Seventy percent of them live within Dunn County. Of the store’s employees, 75 percent are owners, but Halvorson said it’s not something they require. In general, Halvorson said co-ops are great because the owners come through time and time again when the business needs it. The owners care about their business because oftentimes, they’re the ones using it, she said. “There’s just a lot of individual heroes who’ve helped keep that place going for 45 years,” Halvorson said. MMFC is located at 814 Main St E, Menomonie. It’s open 7am-9pm Monday-Friday and 8am-8pm on the weekends. Find them online at mmfc.coop.